Last week Kodaikanal International School hosted the launch of a landmark publication on the town’s history, architecture and ecology. 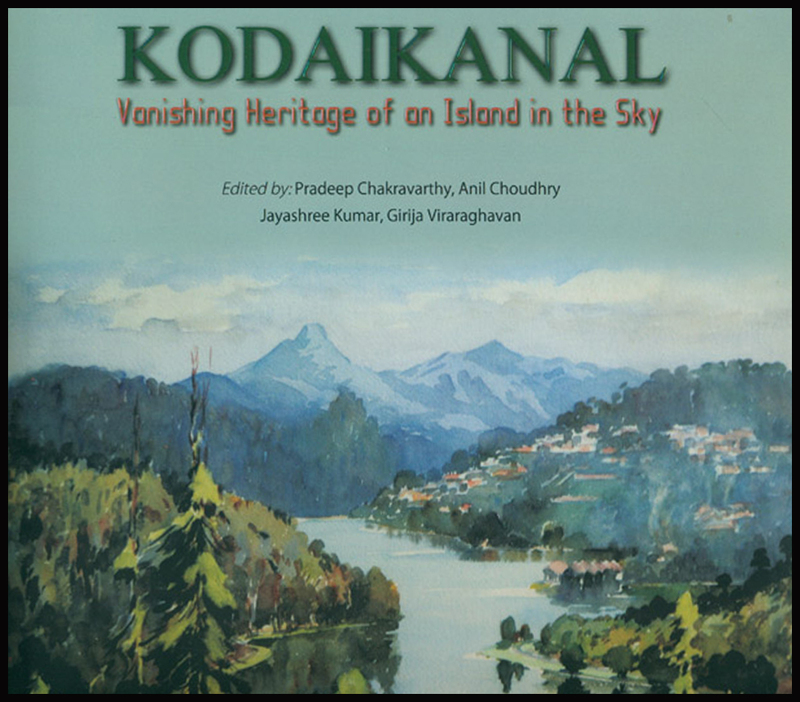 Kodaikanal: Vanishing Heritage of an Island in the sky was officially released at the KMU by principal Corey Stixrud and the team that put the book together. The book is the result of a collaboration of different authors, photographers, architects and the Kodai chapter of the Indian National Trust for Art and Cultural Heritage (INTACH). It was edited by Pradeep Chakaravarthy, Anil Choudhry, Jayashree Kumar and Girija Viraraghavan – all members of the Kodai community with a variety of important talents and interests. The title reference to “sky islands” pays tribute to an idea proposed by Robin Vijayan and now widely used amongst many of us working in ecology and conservation in the southern Western Ghats. Bob Stewart and Tanya Balcar of the Vattakanal Conservation Trust contributed the chapters on the natural heritage of the area. Pippa Mukherjee supported this with important natural history contributions. One of my favorites aspects of the book is the fine architectural drawings of the older bungalows and buildings in Kodai. INTACH commissioned these drawings and sent a team of young architects to make the drawings on site in 2013. The details and presentation of the drawings makes for interesting reading (though you may need the help of a magnifying class as they have been shrunk down to fit the 10” x 10” pages). The chapter on Poombarai village, with its rich illustrations and narratives, illuminates the early, pre-colonial agricultural settlements in the remote Palani Hills. Like many other chapters in the book, it brings forth facts and details about the town and hills that are otherwise not well known. In general this is a must-have book for anyone interested in Kodaikanal, its history and location in the Palani Hills. 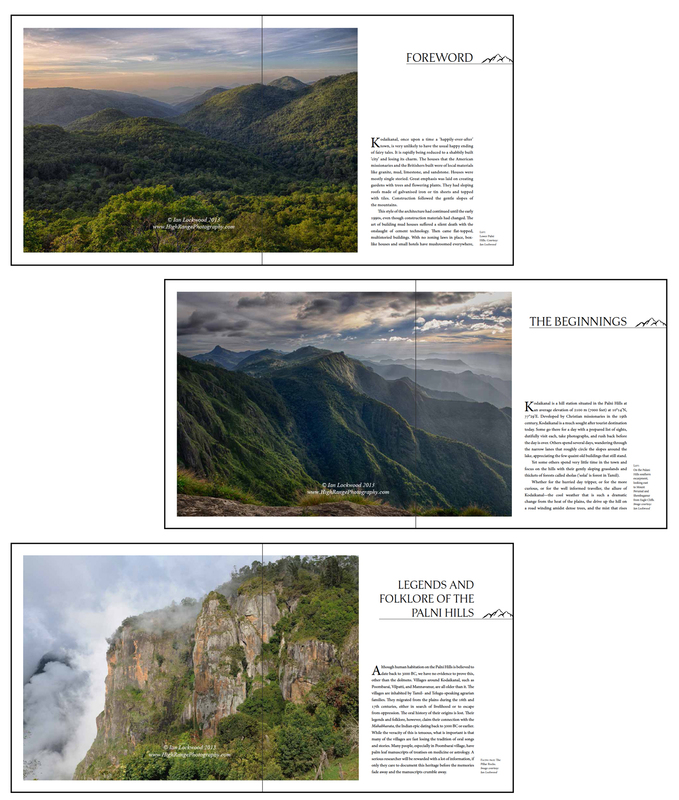 As a contributor (of several landscape and wildlife images) I am slightly irritated that the individual articles and images in the book are unacknowledged (a decision made by the printer, apparently). The quality of maps is disappointing, given the options available. Aside from these minor quibbles, this is a book worth having on your coffee table. Screen shots of some of the opening landscape images. In the final print edition they are slightly different and do not include the copyright stamp and author acknowledgement. 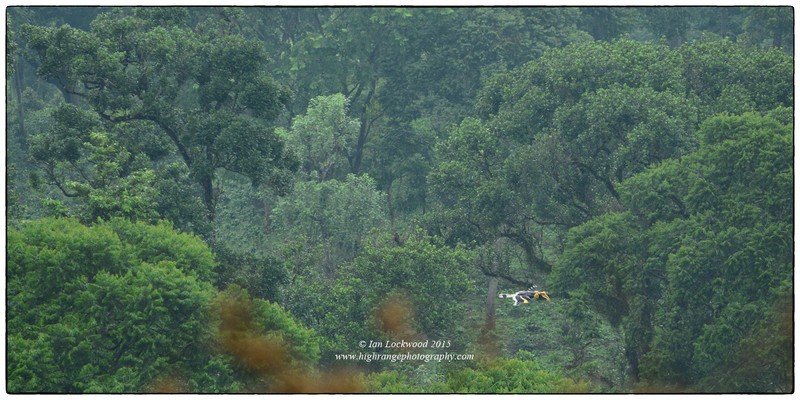 These were mainly taken from my September 2013 visit to Kodai and then processed as HDR images..
Lockwood, Ian. “Palani Hills: Then and Now.” Ian Lockwood blog. September 2013. Web. “ “Up Close and Personal with Trimeresurus macrolepis.”Ian Lockwood blog. September 2009. Web. 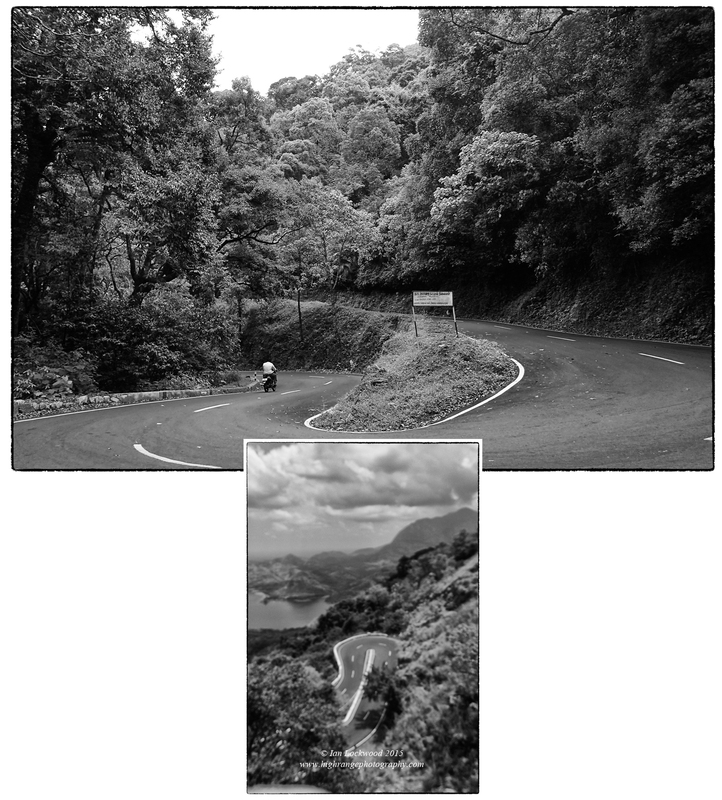 Niyogi Book webpage on Kodaikanal: Vanishing Heritage of an Island in the sky. Web. Wyckoff, Charlotte Chandler. Kodaikanal 1845-1945.London: London Mission Press, 1945. Print & Web. Documenting the landscapes, ecology and cultures of India’s Western Ghats continues to be a life-preserving passion project for me. In recent years I’ve had less time to devote to this as teaching and family commitments have occupied most of my time. However, I try to take several field visits into the Ghats every year in order to explore locations – both well-known and unfamiliar- in new light. 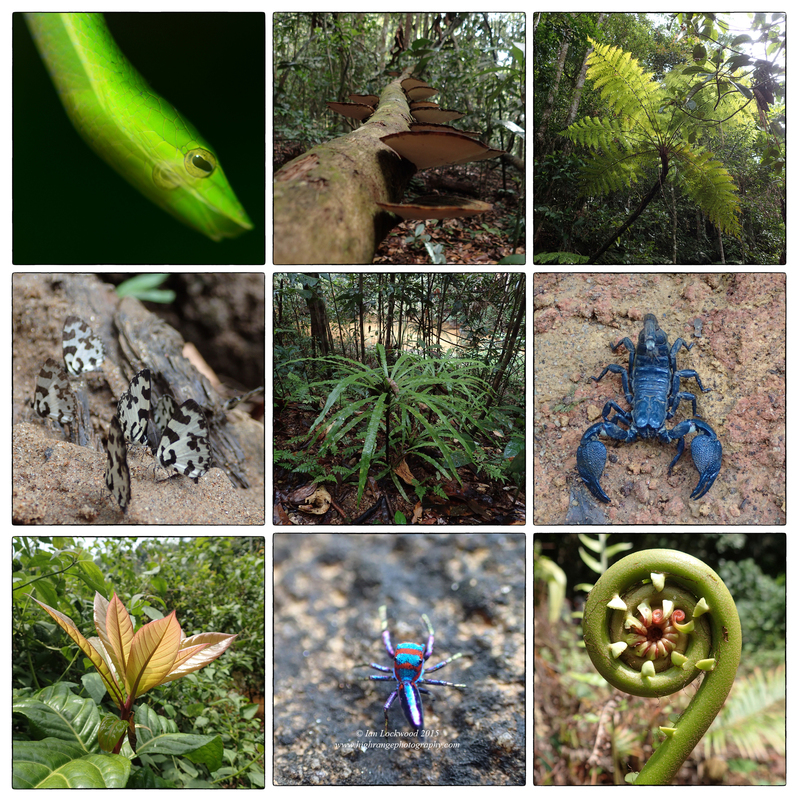 These trips nurture and energize my classroom instruction as well as contributing to my growing body of work on the Western Ghats and Sri Lanka biodiversity hotspot. Several weeks ago I had the opportunity to revisit the Anamalai (also spelt “Anaimalai”) Hills with my daughter Amy and parents Merrick and Sara Ann. The numerous bends in the ghat -something usually associated with nausea -were the source of much happiness with sighting of charismatic Western Ghats species such as Nilgiri tahr (Nilgiritragus hylocrius), Lion Tailed Macaques (Macaca silenus) and Great Pied Hornbills (Buceros bicornis). 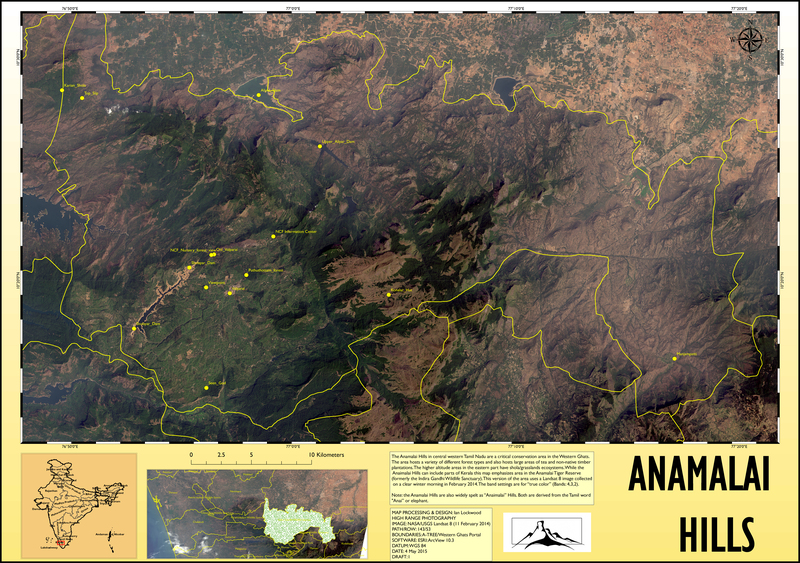 The Anamalais are a critical area for biodiversity in the 1,600 long Western Ghats chain. They host important forest areas including wet evergreen forests and shola/grassland systems in the higher reaches. The northern slopes are relatively dry while the Valparai plateau area has one of Tamil Nadu’s highest recorded rainfall records. The Anamalais have several anthropogenic-dominated landscapes mainly revolving around plantation agriculture. Tea is a particularly important cash crop and expansive tea estates and non-native eucalyptus plantations now cover large areas of the Valparai plateau at the heart of the Anamalai Hills. Several large hydroelectric dams have been built in the hills for electricity generation and irrigation purposes. As on my 2010 visit with Lenny, a key element on this visit was spending time with members of the Nature Conservation Foundation. They have been working in the Anamalais for the last 15+ years with a focus on a variety of key issues including rainforest restoration, mitigation of human-animal conflict and species-specific studies. Their staff has grown from a handful of enthusiastic individuals and volunteers and the group is now recognized as one of the most effective science-based conservation groups operating in India. While I was putting together this post the news came in that M. Ananda Kumar has been awarded the 2015 Whitley Prize (UK WWF) for his work (though NCF) with reducing human-elephant conflict using an innovative SMS warning system. 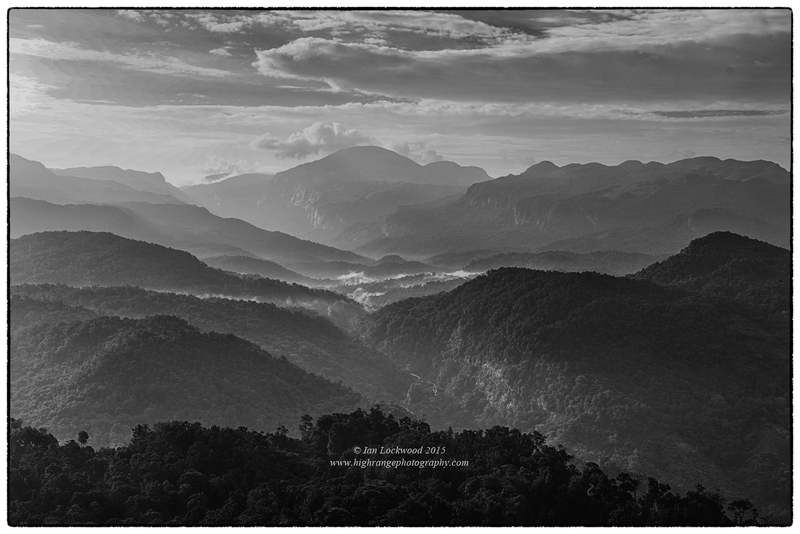 Anai Mudi and the Anai Mudi forests as seen from the southern edge of the Valparai Plateau to the peak’s west. This view is looking south, south-east. Snapshots from several walks int he Anamalais. 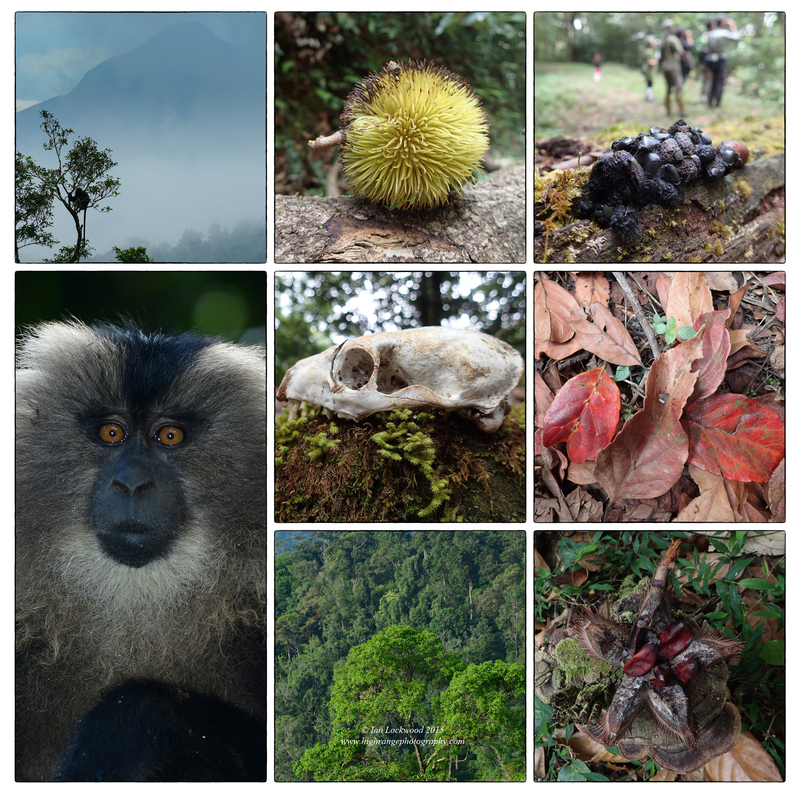 From upper left: Nilgiri Langur, Cullenia, Civit droppings, Elaeocarpus leaves on forest floor, Cullenia opened, canopy of rainforest, skull of a civet or mongoose, Lion tailed macaque. 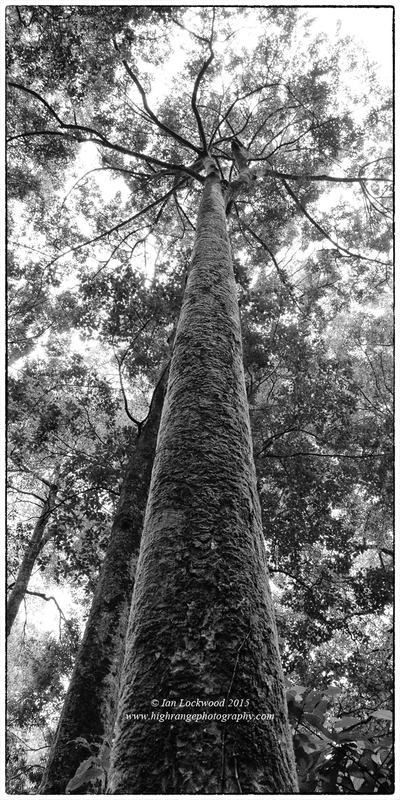 Towering rainforest tree with mossy bark in Cullenia-Mesua-Palaquium dominated forest @ 1,400 meters in the Anamalai Hills. On this visit we spent a morning exploring a mid-elevation evergreen forest fragment near Valparai with a team from NCF. 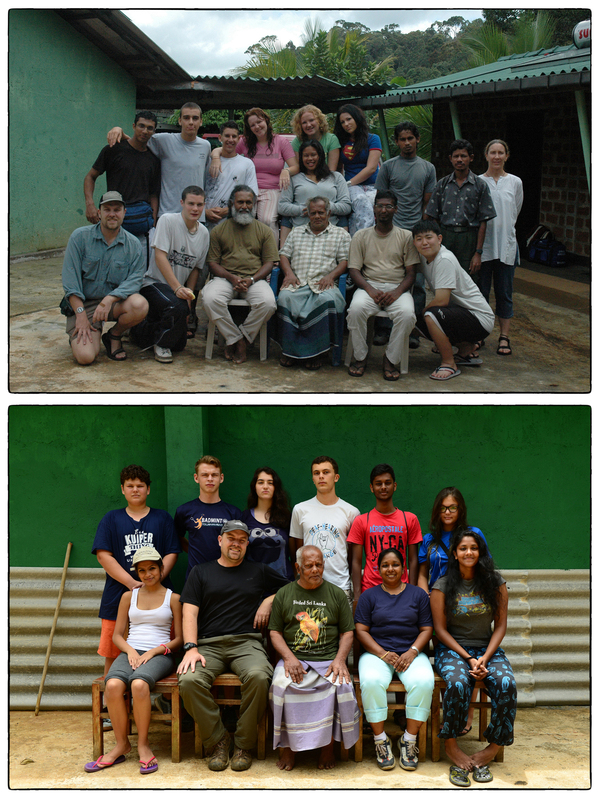 The walk was on behalf of David Westcott and Soumya Prasad who were on a brief visit and we were lucky to tag along. Shankar “Sridar” Raman led us down a disused forest road and was soon picking out hard to identify species from calls and distant movements. A pair of GPHs was calling and gave us a decent view. We logged in views and sightings of a variety of mid-high altitude species including a Mountain Imperial Pigeon, Black & Orange Flycatcher, Black-naped monarch and several others. Mixed species flocks with nuthatches and flycatchers, drongos and Fairy Blubirds were conspicuous. 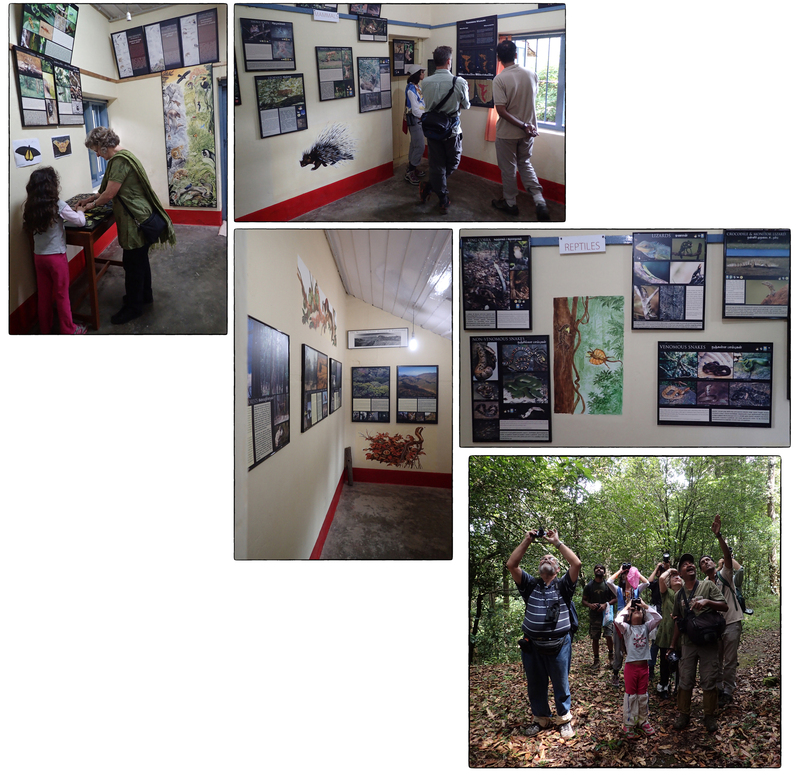 S Vijay Kumar, M. Ananda Kumar and P Jegananthan were along and it was great to have so many sets of eyes scanning all levels of the forest. 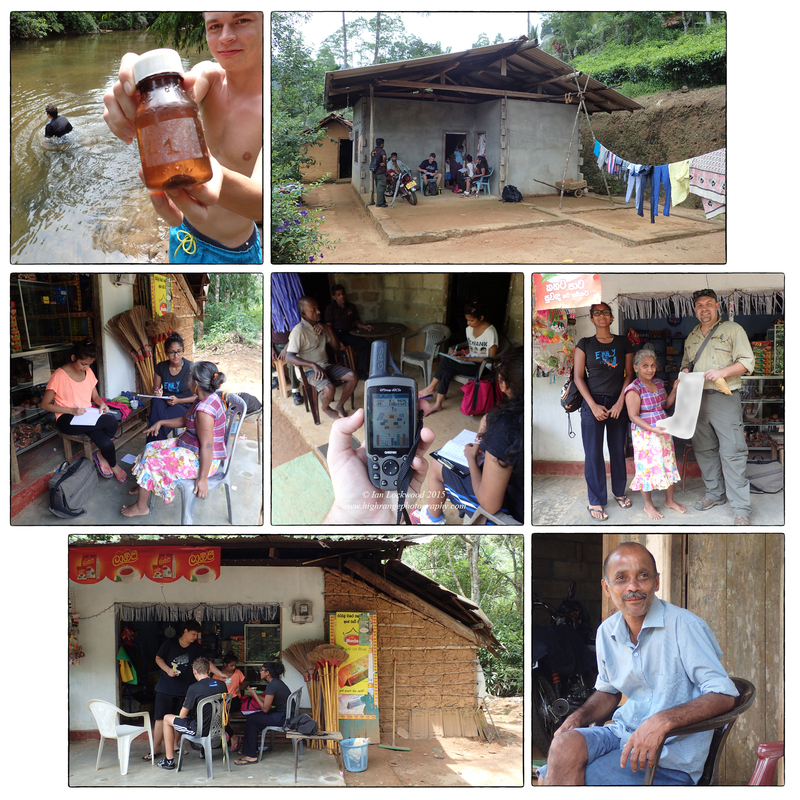 On our return to Valparai we were caught in a violent storm and took refuge in Jegan’s home. That night David (and Soumya) shared a presentation on the seed dispersal roles of flying foxes in Australia. Ananda and his colleague Ganesh Ragunathan also shared the work with SMSs as highlighted in a new short film. Snapshots from the NCF information center. This is a first class interpretation center-something sorely needed in the Palni Hills and other ranges of the Western Ghats. The lower right image is from the forest walk about the time that we had a fine view of the Mountain Imperial Pigeon. During the next day Merrick and I explored out from Valparai to several views points to look for views of the higher ranges and birds. We had several superb views up to Grasslhills and Eravikulam. Anai Mudi overshadows the whole Valparai Plateau –something I remember from the 2002 tahr census hikes up southern India’s highest peak. 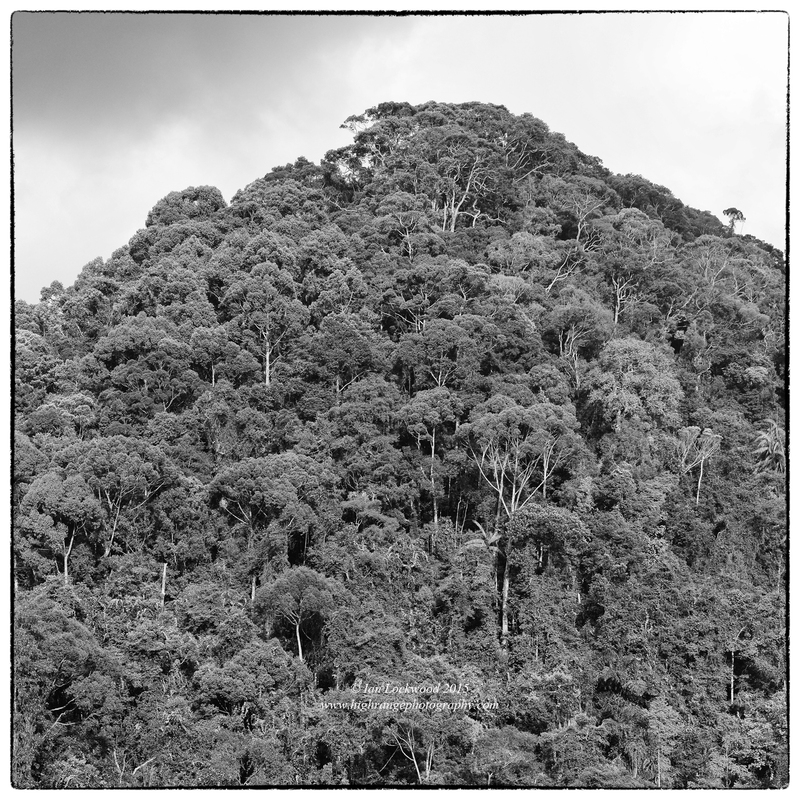 During those visits I sat for hours on the peak scanning the lower landscape for wildlife and took in the full majesty of the rolling plateaus and dense forested valleys. With Amy and Sara Ann, we spent an afternoon observing a GPH nest near the NCF nursery. We were rewarded with fine sightings of the hornbill parents flying in to feed their chick the female had apparently come out of the nest shortly before we arrived. It was a much too short a visit and we left with promises to return to learn more about the Anamalais. On the way out one of the, now famous, LTM troops was at the roadside in the Puduttotam forest fragment patch. The pictures below demonstrate how close you can get, as well as the challenge that human communities pose to these endangered primates. 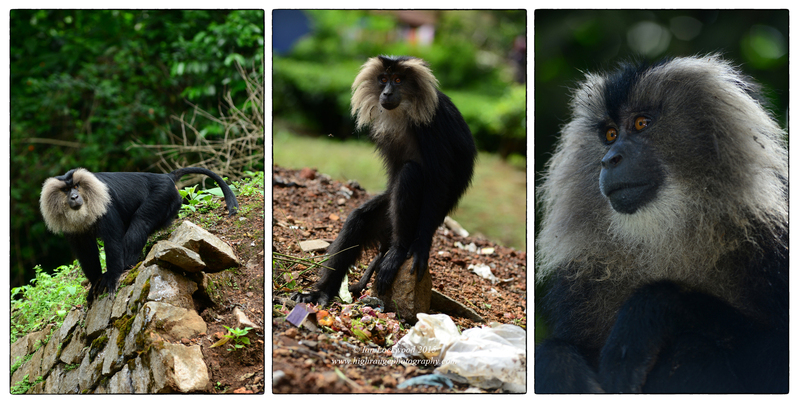 Lion Taied Macaques at Puduthotam Estate. This is a habituated troop that lives in a small isolated island of tropical evergreeen forest surrounded by tea estates. Valparai town overshadowed by the high rolling hills known as Grasshills. A view from the west as suggested by friends at NCF. Great Pied Hornbill (Buceros bicornis) in flight just outside of Valparai in the mixed plantation/forest near the NCF nursery. 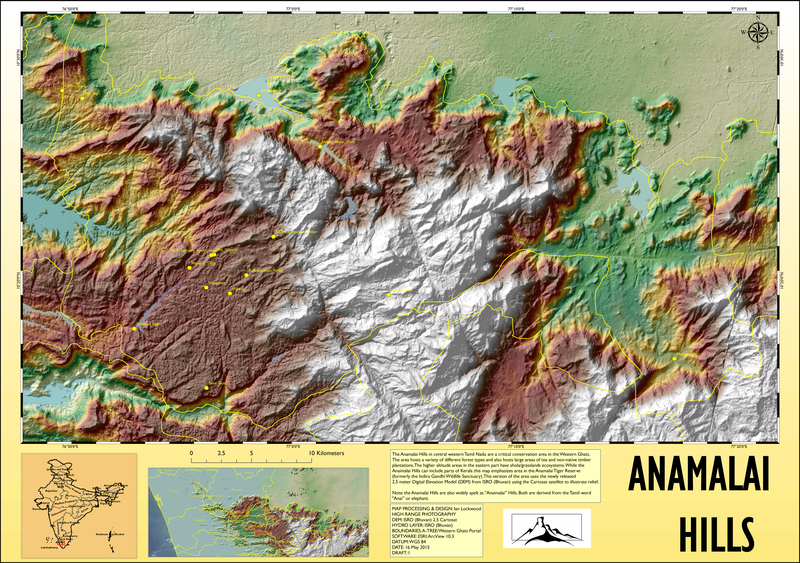 True color rendition of a multi-spectral Landsat 8 image of the Anamalai Hills area. Click on image for a large 150 DPI A1 size version. Infrared (thermal) rendition of a multi-spectral Landsat 8 image of the Anamalai Hills area. Click on image for a large 150 DPI A1 size version. Map illustrating relief and elevation in the Anamalai Hills based on recently released 1 Arc Sec (30 m) Digital Elevation Model (DEM) from ISRO/Bhuvan. Click on image for 150 DPI A1 version. Hamilton, Douglas. Records of sport in southern India chiefly on the Annamullay, Nielgherry and Pulney mountains, also including notes on Singapore, Java and Labuan. London: R.H. Porter. 1892. Print & Web. Kumar, Ananda M. Divya Mudappa and T.R. Shankar Raman. “Asian elephant Elephas maximus habitat use and ranging in fragmented rainforest and plantations in the Anamalai Hills, India. Tropical Conservation Science. June 210. Web. 4 May 2015. Lockwood, Ian. “Restoration & Revival in the Anaimalais.” Ian Lockwood Blog. August 2010. Web.